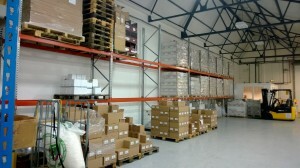 Hampshire Mezzanine has been a long running supplier of shelving and racking for Herb UK in Lymington. On this occasion, HMF returned with the task of fitting out a new unit with adjustable pallet racking and longspan shelving. Herb UK is one of the leading manufacturers of natural hair care products in the UK with many overseas customers. 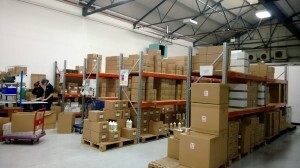 Herb UK required additional storage and picking space to collate and marshal orders and have taken an additional unit within the Ampress Business Park in close proximity to their main factory where the product is made. HMF provided Dexion P90 pallet racking, which is a robust and easily adjustable pallet racking system, to ensure Herb has had the maximum flexibility for adjustment and space utilisation in the future. The Dexion P90 system has a 50mm pitch adjustment which enables the bays to be utilised and beams cited accurately where required whilst maintaining a strong design. This system complies with S.E.M.A (Storage Equipment Manufacturers Association) and also F.E.M (Federation of European Manufacturers). The longspan shelving was formed also from the same P90 racking but with open boarded decking to give a high shelf load and easy future adjustment of storage levels. Safety load notices were fitted to all the racking showing the maximum bay load as well as the maximum weight for a pair of beams, which is fitted by HMF on all storage installations provided. Dexion Protex column guards with a high visibility yellow finish were fitted to the exposed ends of the racking to ensure that these uprights would be protected from fork truck general movements. HMF have completed a number of projects for Herb UK over the last six years, including office fit out work, mechanical, electrical and storage equipment projects, thereby giving Herb UK a complete turnkey option to carry out the complete package. The project was completed on programme and budget and Herb are happy with the installation.